Description: This had a shiny Heritage II and an unpatched ATSF Warbonnet! Description: I happened to catch this unit on the UP in Poplar Bluff, MO in January 2005. Description: This stack train was stopped on a siding to let the westbound Southwest Chief go by. The conductor, Joshua, was stepping out for a smoke. Description: Having just let the Southwest Chief pass, 5399 continues on its way to Winslow 270 miles away. Description: Westbound stack train heads west across the desert at sunset. Description: THE FLYING J TRUCKSTOP IN KINGMAN WITH THE HIGH SPEED BNSF SELIGMAN SUB IN THE BACK YARD. Title: BNSF 5399 EB flying thru town on this nice spring day. Description: BNSF Westbound Intermodal Train passing through La Crosse, Wi. Description: Westbound rock train #23. Title: BNSF 1051 leads the westbound Z NYCLAC9 17 on this very humid 90 degree day. Description: It was nice to finally see something good leading. Description: BNSF 5399 as the DPU on a northbound ballast train. This locomotive ran out of diesel and waits for a tanker truck to fill the locomotives fuel tank. 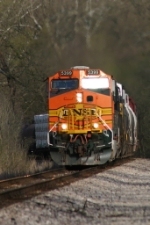 Title: BNSF 738 Leads a SB. Description: heading toward Elsberry on the heel's of a SB freight train meeting 1 northbound at elsberry mo. Description: BNSF's MDYTCSX-09 (Manifest Dayton, TX-CSXT Connection New Orleans, La) heads east on UP's Lafayette Sub. past the old Southern Pacific Liberty Depot.